Last month, Jared Kushner, senior adviser and son in law to President Trump, had his security clearance downgraded. We analyze whether it is a threat to our national security to have Jared Kushner remain a senior adviser. Last month, Jared Kushner, senior adviser and son in law to President Trump, had his security clearance downgraded. So the questions remain —- what led to Kushner’s security clearance downgrade and is it a threat to our national security to have Jared Kushner remain a senior adviser to the President? On Lawyer 2 Lawyer, hosts Bob Ambrogi and Craig Williams join national security attorney Bradley P. Moss from the Law Office of Mark S. Zaid, P.C. and Evan Lesser, co-founder and president of ClearanceJobs.com, as they discuss Jared Kushner’s recent security clearance downgrade, levels of clearance, the overhauling of the security clearance process by John Kelly, the recent loss of security clearance of 30 of President Trump’s aides, and the impact. Attorney Bradley P. Moss is from the Law Office of Mark S. Zaid, P.C. Brad specializes in litigation on matters relating to national security, federal employment and security clearance law, and the Freedom of Information Act/Privacy Act. Evan H. Lesser is co-founder and president of ClearanceJobs.com. Before founding ClearanceJobs, Mr. Lesser managed technical projects with CACI for the U.S. Navy’s Science and Technology directorate at the Pentagon, and for the Joint Technology Panel on Electronic Warfare. Special thanks to our sponsors, Clio and Litera. Bob Ambrogi: Hey listeners. This is Bob Ambrogi and I want to let you know there’s a brand-new show on the Legal Talk Network about the First Amendment. It’s called Make No Law. Here’s a quick trailer about the show. Ken White: News and pop culture are full of controversies about free speech in the First Amendment. We hear terms like Hate Speech and Heckler’s veto and a barrage of coverage about campuses, protests, and even wedding cakes. But what does it all mean, and how did we get here? That’s exactly what my new show, Make No Law: The First Amendment Podcast from Popehat.com will explore. I am Ken White and I invite you to tune in every month for the history, stories and personalities behind the right to free speech and the most important Supreme Court cases establishing it. 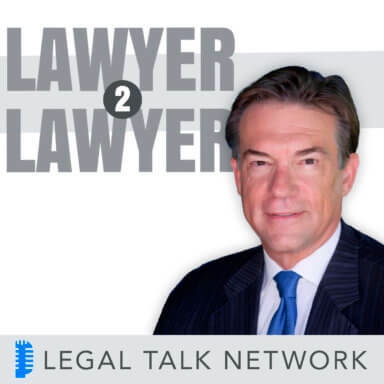 Bob Ambrogi: You can find Make No Law on HYPERLINK “http://www.legaltalknetwork.com/”legaltalknetwork.com, iTunes, Google Play or wherever you are listening to this podcast, and now on to Lawyer 2 Lawyer. Evan Lesser: It will be interesting to see where this ends up having essentially punted to General Kelly. If he follows standard norms, it would appear that these political appointees will not be able to obtain clearance just due to the nature of their backgrounds. Bradley Moss: In my view an abuse and a politicization of this process by the way this administration has allowed individuals with red flags popping up in the investigation to nonetheless continue with interim access and to simply deflect and say, oh, we are still waiting on the adjudication. Bob Ambrogi: Welcome to Lawyer 2 Lawyer on the Legal Talk Network. This is Bob Ambrogi coming to you from just outside of Boston, Massachusetts, where I write a blog called LawSites and also host another podcast here on the Legal Talk Network called Law Technology Now along with Monica Bay. J. Craig Williams: And I am Craig Williams coming to you from Southern California. I write a legal blog called May it Please the Court and a book out called The Sled. Bob Ambrogi: And before we get to today’s topic, let me just take a moment to thanks our sponsor of today’s program. Today’s sponsor is Clio. Clio is a cloud-based practice management software which makes it easy to manage your law firm from intake to invoice. You can try it for free by going to HYPERLINK “http://www.Clio.com” clio.com. J. Craig Williams: Well Bob, last month Jared Kushner, Senior Advisor and son-in-law to President Trump, had his security clearance downgraded. According to an article in The Washington Post, Deputy Attorney General Rod Rosenstein called White House Counsel Don McGahn on February 9 to tell him there were significant issues with Kushner’s clearance and that he was currently keeping him from gaining a permanent clearance. On the matter at hand President Trump is leaving the decision to his Chief of Staff John Kelly, stating in a news conference, I will let General Kelly make that decision and he is going to do what’s right for the country and I have no doubt that he will make the right decision. Bob Ambrogi: So the question remains, what led to Kushner’s security clearance downgrade and having Jared Kushner remain a Senior Advisor to the President, is it a threat to national security. Today on Lawyer 2 Lawyer we are going to take a look at this general issue of security clearances and the law and procedure around it and we will take a closer look also at Jared Kushner’s recent security clearance downgrade, levels of clearance, the overhauling of security clearance process by John Kelly and the loss of security clearance by 30 of President Trump’s aides and the impact. J. Craig Williams: Well Bob, to do that we have got a great line up for our guest today. Our first guest is attorney Bradley P. Moss from the Law Office of Mark S. Zaid, P.C. Brad specializes in litigation on matters relating to national security, federal employment and security clearance law, as well as the Freedom of Information Act and Privacy Act. Welcome to the show Brad Moss. Bradley P. Moss: Absolutely. Thank you guys. Bob Ambrogi: Also joining us today is Evan H. Lesser. Evan is Co-Founder and President of ClearanceJobs.com. Before founding ClearanceJobs, he managed technical projects with CACI for the U.S. Navy’s Science and Technology Directorate at the Pentagon, and for the Joint Technology Panel on Electronic Warfare. Previously he worked for Boeing on its Reserve Component Automation System Program for the U.S. Army in Metro Washington. Welcome to Lawyer 2 Lawyer Evan Lesser. Evan H. Lesser: Thanks so much. Good to talk with you. J. Craig Williams: Well, as we get started, let’s take a look at the overall perspective of security clearances and how they work within the Executive Branch and who is required to have them in order to do what. So Brad, let’s start with you, if you can do that. Bradley Moss: Sure. So the entire security clearance process is derived from Executive Order issued by the President, the current ones, have been issued originally by President Clinton and they have been updated and modified by Presidents Bush and Obama. And what they outline in the process is that anybody who requires access to U.S. government classified information at any level; confidential, secret or top-secret, those individuals have to undergo a security clearance vetting, which includes submitting very detailed paperwork called the SF 86, a 127 page questionnaire that asks pretty much every question you can imagine about your life. They also have to undergo what’s called a National Agency Check, which looks into your criminal history as well as a Credit Report to check your financial background. The purpose and the nature of the investigation is to look into any number of things in your background that would pose a risk, that would make it so that the government would not want to permit you to have the privilege of access to classified information; it could be personal financial problems, if you have a history of financial insolvency, it could be personal criminal history, alcohol problems, drug problems, extensive foreign connections that would put you at risk of exploitation, any number of things along those lines. And the purpose of this process is to pull out the entirety of your background and to make sure that when someone is granted access that the government is confident that that person can in fact be trusted with that access and it doesn’t pose a risk to national security. Bob Ambrogi: And what does it mean Bradley Moss, what does it mean to get a security clearance, what does that do for somebody? Bradley Moss: Sure. So the only individuals who can be vetted for a clearance are those who have been sponsored for access. That typically is military officials, political appointees, US government civilian employees or contractors on U.S. government contracts. There’s no process by which a private citizen, just because they like the idea, can get vetted for clearance. Only those who are vetted are those who are specifically sponsored in furtherance of U.S. government projects and work. And to be granted the clearance and depending on the level at which you are granted, affords you access to certain levels of classified databases, classified email accounts and hard copies of classified documentation. If you think of different types of particular work that people do, think of a linguist or an intelligence officer at the CIA or at the FBI, they are going to acquire access to certain types of information in order to form their position responsibilities, in order to translate documentation, in order to analyze intercepts of communication between foreign nationals, anything along those lines. Those are the basic nuts and bolts of how the classified arena works and in order to perform that work you have to have been cleared for access at different levels. Bob Ambrogi: Are there levels of security clearances or types of security clearance? Bradley Moss: Sure. So the level of — there are three levels of classified information and there are clearances for each corresponding level. So there’s confidential, which is the lowest, secret, and then top-secret. And the difference in the levels merely reflects the sensitivity of the information at issue and the extent to which unauthorized disclosure of it would harm national security. So the higher level of classification, the greater sensitivity, the more damage that would be caused if that information was ever exposed to unauthorized individuals. Beyond those three levels, there are compartmentalized accesses that aren’t different levels of classification so much as it is separated programs to which you are additionally allowed to be granted access on specific as needed basis. This is called Sensitive Compartmented Information, also known as SCI. There’s another term also that’s used, it’s called Special Access Programs or SAPs. These are particular programs into which individuals as part of their work responsibilities for the U.S. government will be specifically briefed, be specifically read in on to the particular program’s details. They will sign additional nondisclosure paperwork as part of their work on that specific program. And at such time that they no longer require access to that program as part of their work, they are debriefed or read off the program. Craig J. Williams: And what role does the relationship, the familial relationship between Kushner and Trump play in this issue? Bradley Moss: Well, this has presented a very unique and unconventional problem for the government to face, because since Robert Kennedy served as Attorney General, there has been an institutional custom that family members do not serve in the government. There’s an anti-nepotism law that Congress passed in the wake of RFK serving as Attorney General that was meant to prevent a recurrence of that type of situation, where you couldn’t be working as say the Secretary of Housing and Urban Development and have your son working as a senior official, as a federal employee. It was specifically designed to prevent that, to avoid nepotism, to avoid a problem of having a senior management official, having a family member working with them who would then have a different type of employer-employee relationship than everybody else. When the President came into office, the Department of Justice issued a new memo, a new guidance from the Office of Legal Counsel reversing decades of institutional precedent and saying that the anti-nepotism law did not apply to White House staff, that the President was still permitted, notwithstanding the anti-nepotism law, to hire family members to serve specifically as White House staffers. That’s why Jared Kushner and later Ivanka Trump were allowed to come on as Senior Advisors to the President. So now you have a problem here where you have a family member serving the President and the President is very notorious for his loyalty to his family members, and demanding loyalty from people who work for him, being vetted for clearances, presumably, at least ostensibly, on the same standards and guidelines as everybody else working for the US government. But now, you are a security official vetting Jared Kushner and Ivanka Trump knowing that if you conclude that they can’t be entrusted with access to classified information, you are going against the President’s own children. And so that races a significant problem from an ethical standpoint and from a bureaucratic standpoint of how we handle this scenario and how we ensure that these two individuals, Jared and Ivanka, if they are in fact ultimately granted fully adjudicated clearances are done so on the merits and appropriately and properly and consistently with the adjudicative guidelines and not as an exception to the rule because they are the President’s kids. Bob Ambrogi: Evan, do you see the same issue? Are you at all concerned about the family relationship here and the implications of that for the security clearance? Evan Lesser: Well, I think the main problem that we are coming up against right now, as was alluded to, is the fact that we are kind of in uncharted territory at this point. In modern times there have not been people in the White House who are appointed into fairly high-level roles that have the type of backgrounds that we see presently. So you have got a lot of people who are advising the President who are not career civil servants, they have not been in government and in fact, they are coming from backgrounds that are heavy into business. You have got people with some extensive foreign ties. You have got people with extensive debt, even if they have a high amount of income, they still have a lot of debt due to the nature of their businesses. You have got people with a very public persona, they are not unknown, they are highly known to the world and that could actually open them up for — potential for bribery or coercion. So it’s really difficult to understand where we are at at this point and what the proper solution may be, simply because this is all so brand-new. If you think about typical appointees to White House roles, these are people that have pretty ordinary backgrounds, traditionally. They have been career civil servants. They probably have had security clearances in the past. I mean frankly, their lives may look a little boring compared to the current White House. But I think really that’s the issue that we are in is do we follow concepts that have been put in place over the last many, many decades and follow those, or at this point is everything kind of up for grabs and is a brand-new situation with brand-new norms being created. So again, it’s just extremely new for everybody. J. Craig Williams: And what are the consequences if it turns out that Kushner’s clearance doesn’t get approved, or is revoked, now that he has reviewed sensitive documents, how do we un-ring that bell? Evan Lesser: You really can’t necessarily un-ring the bell. Once you have seen high levels of classified information, it’s not like you can just forget it. But what is done is that someone who undergoes the clearance process and essentially is taking a statement of vows and saying that they are going to agree to certain terms that the government puts forth. And I am talking in a general sense, that even if you have a security clearance level at a high level and you have seen certain bits of information that even when you no longer have a clearance, divulging that information can be seen as a federal offense. So it’s really important to understand that people with clearances, once they lose the clearance just don’t immediately go out and start writing books and letting that information out. Part of having a clearance is being able to maintain that secrecy over time. Now, in the current White House, it does pose some problems, because it’s still unknown as to whether some of the political appointees are actually going to be able to get a final clearance. Kind of the issue that we have seen in the last few weeks is that technically if the President wanted to grant someone a clearance, all he has to do is simply raise his hand and say I want this person to have one, and they would get one. Now, where we are running into some trouble is trying to compare someone like a family member to the President, to an ordinary security cleared worker, someone who is doing finance or accounting work or running a network or something very — very ordinary type of work. These are radically different people and if they are granted security clearances, how they take that into their post-White House lives could be an issue. At the same time, if they are denied a clearance outright, what does that mean for the future in terms of bringing people onto White House staff that may be in a similar space. It will be interesting to see where this ends up having essentially punted to General Kelly. If he follows standard norms, it would appear that these political appointees will not be able to obtain clearance just due to the nature of their backgrounds. Bob Ambrogi: Brad, on your Twitter page I can’t help but notice the big banner atop the cross of the page says, the Trump White House is Making a Mockery of the Security Clearance Process. What do you mean by that? Is it more than what you have already said? Bradley Moss: Sure. So that particular banner came from a column I wrote a few weeks ago in the wake of some of the stories about Jared Kushner and the interim access and the problems he was having. What that was referring to, and this is kind of expanding upon what Evan was talking about, we have a specific and particular issue with this administration in terms of abuse of interim access or interim security clearances. So the idea of interim security clearances existed for a long time, there’s plenty of legitimate reasons for it. The idea is that you bring in an individual whose particular skill sets are immediately needed, the assignment has to be addressed immediately, but the vetting process, especially for high level security clearance, top-secret, top-secret with SCI access, things along those lines, takes months. It can easily take 6-12 months depending on the background of the individual and how much has to be investigated and how complicated it is. So with an interim clearance, it gives the person access to classified information while that investigation is ongoing, and to grant someone interim access all that generally occurs is the agency who is investigating; it’s usually the FBI or OPM will review the Standard Form 86, that’s security questionnaire, they will run the National Agency Check in terms of your criminal history and they will run your Credit Report. And if no immediate major red flags pop up in that initial review, they will grant the interim access with the understanding that that doesn’t mean you ultimately will get a full security clearance, it just means for the moment you are being permitted access to this information. Now, where we have a problem with this administration and the interim access is granting it or permitting the continuation of the granting of an interim access when clear problems and red flags have emerged in the course of the investigation. We saw that with Rob Porter, the former White House Staff Secretary, where the FBI warned the White House on more than one occasion that there were red flags coming up in the investigation about the domestic abuse allegations. In a typical rank and file situation for one of my clients what would almost always happen in that type of situation is the person’s interim access would have been withdrawn the moment that red flag popped up in the investigation. They would have been put on administrative leave, sent home and told you will now have to wait until the investigation finishes and until an adjudication is made on whether or not to grant you access or not and you can’t come back until that’s done. It is in my view an abuse and a politicization of this process by the way this administration has allowed individuals with red flags popping up in the investigation to nonetheless continue with interim access and to simply deflect and say, oh, we are still waiting on the adjudication. It’s not an illegal act, it’s certainly still within their legal authority to do this, but it is a subjective determination they are making that abuses the need and the concept of an interim clearance in a way that is not afforded to rank and file officials. J. Craig Williams: And what are the violations for this situation? Is there a circumstance where a violation is punishable by more than just revoking the clearance and what about the other players in this whole thing? And is kind of a companion to that question, is this really a significant problem or is it something we see in every administration, these number of issues? Well, let’s go to Evan. Evan Lesser: So as I mentioned before, we are definitely in uncharted territory because most interim clearances are technically supposed to expire after 12 months. There’s occasionally an option to add another six months on complicated cases, but what we are seeing now is brand-new. We have got interim clearances that have gone 12 plus months. I think what probably should have happened from the start is to realize that someone with such a complicated background as some of the people have been appointed in these senior advisory roles were never going to get a clearance to begin with unless the President simply said, I don’t care about their background. I need them to have a clearance for their job. And that really probably would have alleviated a huge amount of confusion and issues if from the start the President had just simply said, listen, these people are not going to be able to get one if we use the standard procedures because of their backgrounds, so let’s just go ahead and get them a clearance, this is on me, let’s get it done. That would have been a much cleaner, clearer way. By trying to put someone who is inherently known to not be able to get a clearance through the process, I can see where some people might say, it’s kind of making a mockery or spitting in the face of the traditional process. These are not traditional people. These are not typical people. These are extremely complex people with extremely complicated backgrounds and the chances of them ever being able to get a clearance if they were applying for a typical contractor role is just absolutely none, just due to the nature of their backgrounds. So where we end up, I really don’t know, but interim clearances in general are fairly low risk because people who understand that they have a problematic or sketchy or complicated background usually don’t put themselves up for a clearance investigation. If you look at the total number of interim clearances that are actually granted, about 70% of interim clearances actually make their way to a final clearance. A fairly small, 20-30% are denied. So, most people who go through the clearance process don’t put themselves in it if they know that they have got a background that would prohibit them from actually getting it in the first place. J. Craig Williams: Well gentlemen, before we move on to our next segment we are going to take a quick break to hear a message from our sponsor. Bob Ambrogi: Imagine what you could do with an extra 8 hours per week. That’s how much time legal professionals save with Clio, the world’s leading practice management software. With intuitive time tracking, billing and matter management, Clio streamlines everything you do to run your practice, from intake to invoice. Try Clio for free and get a 10% discount for your first six months when you sign up at their website HYPERLINK “http://www.clio.com/”clio.com. That’s HYPERLINK “http://www.clio.com/”clio.com with the code L2L10. J. Craig Williams: And welcome back to Lawyer 2 Lawyer. I am Craig Williams with Bob Ambrogi, my co-host, and with us today is National Security Attorney Bradley P. Moss from the Law Office of Mark S. Zaid, P.C. and Evan Lesser, who is the Co-Founder and President of ClearanceJobs.com. Right before the break we have been talking about security clearances and some of the consequences, but is there any consequence to President Trump arising out of 30 failed clearance issues or how do we know that he is not still sharing information with these people that have lost their clearances? Evan Lesser: I don’t know if we will ever truly know for certain what the President discusses with some of these individuals, like Jared Kushner, who have had their interim access downgraded. I think we have to just in good faith assume that he is at least trying to comply with these restrictions. Obviously Jared Kushner, for example, lost access to the Presidential Daily Brief, which was something he was able to see a copy of each morning when he still had his top-secret clearance with SCI access; now that’s been reduced down to secret. He no longer has that access. Someone with only secret clearance cannot review the PDF. Beyond that, I mean there’s a limit to the extent of how you can micromanage a President in that sense, because the President has unequivocal constitutional authority to discuss any classified information he wants with anyone he wants. The only limits on that, the only restrictions are political. There are two political restrictions and that’s the Twenty-fifth Amendment and Impeachment, outside of that there’s no legal or constitutional restriction on the President from discussing everything he just read in the Presidential Daily Brief with Jared Kushner every single afternoon. If he wants to do that, he can do that. Bob Ambrogi: What is the legal process for somebody, let’s say outside of the White House, somebody else who’s denied a security clearance, you talked about adjudication of their denial earlier, Brad, how do they get to that point? How do they challenge it and what kind of a process do they go through? Bradley Moss: Sure, so the executive orders that set up the clearance process also set up the appeals process if your access is denied. What we have set up is that the adjudicating entity will issue what is generally called a letter of intent or my notice of determination that terminology changes from antedated entity. But it will outline the specific allegations that are being used as the factual basis to deny or revoke 25:56 and it will identify the particular adjudicative guidelines that were implicated by those factual allegations, whether it’s foreign influence in terms of exposure to foreign contacts and foreign businesses, whether it’s alcohol. In terms of having an alcohol condition or past history of alcohol abuse, if it’s drugs, if it’s financial problems, if it’s psychological issues, it has not been properly addressed. It’s the past history of mishandling classified information or misusing government information systems, anything along those lines, they’ll outline those details for you and outline then the steps you take. Generally speaking, it depends again between agency to agency on which happens first. Usually, the first level of the appeal is a strictly written submission to the security office. You can provide any supporting documentation, you can outline why you believe these various factual allegations are either inaccurate or have been mitigated and adjudicative guidelines provide various explanations of mitigating factors. If that first level appeal is unsuccessful, generally speaking at that point, go to a second level appeal which is before a senior panel, caveats of certain agencies do it in a different way. But it generally goes before a senior panel of officials from the agency in a personal appearance in which you make your case in person and try to persuade that senior panel that the security decision was erroneous and that you should in fact be granted access. If that fails, that’s the end of the process. It is a strictly administrative process, there’s no one to judicial review, there’s no right to access to any classified information that might ultimately be involved which does on limited but sometimes occasional circumstances come into play and that is where generally, we advise people to have retain counsel. It’s all at your own personal expense, but that is where there is a small group of lawyers such as myself, who tend to represent individuals across the intelligence community in making these appeals. J. Craig Williams: Do you see any threat to our national security arising out of this or of these issues beyond what we’re obviously investigating in the Russia investigation and Mueller’s, and apart from that, what are these security clearance issues due to our national security? Bradley Moss: As far as national security goes, some of the biggest issues on the clearance process is simply about timing. Presently, to obtain a final top secret clearance, you’re looking at over 500 days to obtain a final secret clearance, we’re looking at over 220 days. There are roughly 700,000 people awaiting investigations with about half of those being initial final clearances, the other half being reinvestigations of existing clearances. So, if you look at the national security aspect, I think one of the biggest problems out there is simply the time it takes to get people clearance because you can’t get on the job, you can’t do the work that you’re hired to do until you have the clearance. Granted, some people are getting interims, but interim clearances unlike what we saw in the White House are generally granted at the secret level, and there’s only so much work that can be done at the secret level. The bulk of positions out there that we see are at the top secret level. So, the timing around obtaining clearances is surely a national security issue, simply not enough people to do the jobs that are required. Another issue around the timing is the fact that if someone is sitting for 6, 8, 10, 12-plus months waiting for their clearance to process; at some point, they just get tired of waiting. Some of them get spooked, some of them get tired, some of them get bored; regardless, they leave the process never to come back. Over the last really five or so years, the total population of cleared people has dropped by about 30%. In 2013, there were over 5 million people with security clearance, now there’s about 3.5 million. And the government frankly does not have people to spare. So, with the clearance process taking extremely long, people don’t want to go through this long in the time-intensive rigorous process. It’s really creating a national security issue simply because we can’t staff the national security positions that they need to get staffed. Bob Ambrogi: So, those security clearances are essentially transferable, once you have one, you can then move to another job and take that with you, is that right? Evan Lesser: Yeah. Ideally, yeah, that would be the case, but the government has had an issue with reciprocity between federal agencies for ages, for ages and ages. The problem is that if you’ve got a — let’s say a Department of Energy Clearance and you want to move to the DoD or you’ve got a Department of State Clearance and you want to go to the FBI, it’s extremely rare that you can move from one agency to another and simply keep your clearance. There are different investigative and adjudicative standards between agencies, and frankly, the databases simply just don’t talk to each other. So, once you have a clearance, typically, you have to stay with the same agency unless you are willing to undergo a brand-new investigation with a brand-new agency. Bradley Moss: Yeah, and I will supplement that. I mean, Evan is very much right, there is a serious problem with reciprocity which was implemented through directive from the Director of National Intelligence, trying to make it easier for people to be able to make clearances portable basically so they could go to other agencies and contractors or its government employees. And there have been, to be fair, there has been some improvement, it’s gotten somewhat better, but as Evan noted, there are certain agencies and I’ll highlight CIA here in particular, who are obnoxiously arrogant about how perfect their own investigative standards are and how often will abuse this process and say, we understand the reciprocity guidelines are there but we don’t believe this is an appropriate circumstance, so we’re going to conduct our own brand-new investigation and drag a person through 6-12 months of the new vetting despite the fact that they may have been vetted at that exact same level of access, almost two years earlier. It’s a very serious problem. It all comes down to someone of institutional turf wars and there’s no real right of recourse of legal remedy for people who get caught up in it. If the agency to which you’re transferring decides that they want to do a new investigation, there’s no real means by which you can force them to accept your clearance. They can choose to play bureaucratic games if you kind of get just stuck in the middle. J. Craig Williams: Well, it’s really fascinating stuff. I’m afraid we’re about out of time and I do want to give each of you an opportunity to kind of give your closing thoughts on what we’ve been talking about today, and also let our listeners know how they can learn more about your work and follow up with you. So, Bradley Moss, let’s start with you. Bradley Moss: Sure, well, I think we’re facing with this current administration and all administrations start off with their bumps and bruises as they get their sea legs is a group of people who have no real prior understanding of how the government works and of how the clearance process itself requires such an invasive examination of people’s backgrounds. And I think they’re struggling to this day, 14 months into it, to truly get their — wrap their head around it to figure out who’s going to get cleared and who’s not. I think they’re finally, at last, making some real headway on claim resolution to that initial set of people who came on, such as Jared Kushner, in terms of getting to a final decision one way or the other of who will have clearances and who is going to have to leave the administration. But this problem exemplifies why for so long, we’ve always learned about bringing in completely brand-new individuals with lengthy extensive backgrounds overseas, who don’t have any prior experience dealing with this world. Not because there’s anything wrong with them or there is any questions of loyalty, but just because the vetting process for people with clearances is so strict. It is so difficult enough for people who’ve been in this world for years that it’s truly a problem in trying to bring in these individuals, such as a Jared Kushner from the outside. Anybody that has questions, I always tell people, always consult a lawyer, it doesn’t have to be me, but always consult a lawyer if you ever can go to the clearance process. It’s easy to do things upfront; it’s a lot cheaper than if you get denied. I can be reached at [email protected] or you can reach out to me on Twitter, it’s @BradMossEsq. Bob Ambrogi: Thank you very much. And Evan Lesser, Co-Founder and President of HYPERLINK “http://www.ClearanceJobs.com” ClearanceJobs.com, your final thoughts? Evan Lesser: So, I think one of the things that we did not talk about today were some of the misconceptions around security clearances. I think unless your listeners are — or have been in this industry, there are a couple of misconceptions that I’d like to clear up. I think it’s helpful for understanding the true scope of the issues we’ve been talking about today. The biggest misconception is just exactly how much information someone with the security clearance actually has. If you have a clearance, I always say, it’s not like the movies where you can walk up to a computer terminal and just start viewing enlisted classified information. Your clearance level is directly tied to your job and the classified information you have access to is only enough to do your job. Everything is compartmentalized to some degree, even at the lower clearance levels. So, in fact, some people who are cleared actually have no access to classified information at all. For example, the person fixing the air conditioning in The Pentagon or the Sous Chef in the White House are both cleared, but they don’t have any access to classified information. So, I think that’s the first thing to clear up. The second big misconception is exactly who has clearance, and then I kind of alluded to it a second ago, the movies and popular culture makes us think that it’s all cloak-and-dagger kind of stuff and that the most common security cleared person is some spy or an intelligence analyst or some high-level presidential adviser. The reality is, is that the bulk of people with security clearance, the most typical people, they’re doing accounting work, they’re doing IT work, they’re doing engineering. We call them Secret Squirrels on the ClearanceJobs site and they are just really your average office worker who happens to work for or with the government. In terms of getting more information about security clearances in general or looking at some of the job opportunities our website is HYPERLINK “http://www.ClearanceJobs.com” ClearanceJobs.com. Bob Ambrogi: Thank you very much. J. Craig Williams: Well, Bob, that brings us about to the end of our show, do you have any final thoughts you’d like to wrap up with? Bob Ambrogi: No, I don’t. Yeah, I thought this is really fascinating. The security clearance process is something I don’t know a lot about and I learned a lot during this conversation, so I really appreciate the thoughts and insights of our guests. Evan Lesser: Thank you. Good to talk with you. J. Craig Williams: Great, and thank you very much. Well, for our listeners if you liked what you heard today, please rate us in Apple Podcasts. Bob Ambrogi: You could also visit us at HYPERLINK “http://www.legaltalknetwork.com” legaltalknetwork.com where you can leave a comment on today’s show and sign up for our newsletter. This is Bob Ambrogi on behalf of Craig Williams and everybody at the Legal Talk Network. Thanks for listening and join us next time for another great legal topic; when you want legal think Lawyer to Lawyer. Outro: Thanks for listening to Lawyer 2 Lawyer, produced by the broadcast professionals at Legal Talk Network. Join J. Craig Williams and Robert Ambrogi for their next podcast, covering the latest legal topic. Subscribe to the RSS feed on HYPERLINK “http://www.legaltalknetwork.com” legaltalknetwork.com or in iTunes. The views expressed by the participants of this program are their own, and do not represent the views of nor are they endorsed by Legal Talk Network, its officers, directors, employees, agents, representatives, shareholders, and subsidiaries. None of the content should be considered legal advice. As always, consult a lawyer.